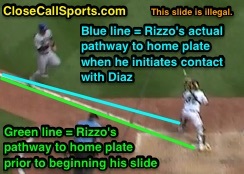 A Major League Baseball source confirmed precisely what we wrote yesterday: that MLB's Replay Official failed to overturn Monday's bona fide slide rule interference no-call in Pittsburgh, finding that Cubs runner Anthony Rizzo's force play slide on Pirates catcher Elias Diaz was illegal, did not meet all four criteria for that of a legal bona fide slide, and should have been deemed interference. In verifying that the League considered Monday's Replay Review decision an incorrect outcome, the unnamed source told ESPN that both teams had been informed of the league's bona fide mistake and that Rizzo and Chicago batter-runner Chris Gimenez should have both been ruled out. 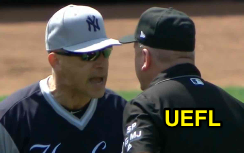 Related Post (and Video): MLB Ejection 051 - Mark Carlson (1; Clint Hurdle) (5/28/18). This is simply the latest in a string of Replay Review controversies. > In April 2018, Tigers Manager Ron Gardenhire claimed that MLB admitted it erred when a Replay Official overturned a safe call at home plate. 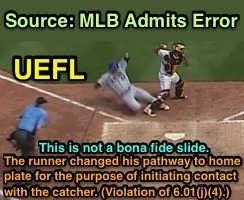 In response to Detroit's claim that MLB admitted wrongdoing—namely that the review took too long (three-and-a-half minute) and that the play was overturned despite a lack of clear and convincing video evidence—the League put out its own statement in which it disputed Gardenhire's account, stating that the Replay Official made the correct call, and used conclusive evidence to do so. Related Post: Tigers Feud with MLB Over Alleged Replay Wrongdoing (4/2/18). > In September 2017, MLB admitted it botched a home run Replay Review in San Francisco, incorrectly ruling that a batted ball that would have hit the green metal roof in fair territory in AT&T Park's right field area if not for a fan's touch was not a home run, thus overturning 1B Umpire Tom Woodring's on-field ruling of "home run." The proper call was Woodring's original call of "home run." Related Post: MLB Admits HR Replay Error in Giants Game (9/1/17). > In August 2017, 2B Umpire Mike Everitt ejected Yankees Manager Joe Girardi for arguing a bona fide slide rule interference no-call affirmed as legal by Replay Review. The call concerned Mariners baserunner R1 Jean Segura, who slid into second base with his arms raised and having appeared to deviate from his direct pathway to second base in order to interfere with Yankees shortstop Didi Gregorious' subsequent throw to first base. Despite the Replay Official's decision that the play should stand as legal, the UEFL Appeals Board reviewed and determined in a 6-3 ruling that the interference no-call was itself an incorrect call. Related Post: MLB Ejection 153 - Mike Everitt (3; Joe Girardi) (8/27/17). > In May 2017, MLB admitted its staff improperly failed to accept for Replay Review Boston's Manager's Challenge pertaining to the issue of whether a pitched ball hit the batter or missed him entirely (dead ball strike vs. no touch), despite the on-field crew's attempt to review the play. After the game, the League issued a statement explaining that the Replay Official and Replay Supervisor both misinterpreted the call on the field and thus incorrectly determined the reviewable play to be non-reviewable. MLB's statement declined to state what the misinterpretation was. 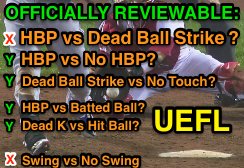 Related Post: MLB Admits Error on Swinging HBP Strike Non-Review (5/26/17).